Becca- you're a goof! More white the BETTER!! OMIGOO'NESS....peshus beebee! DETAILS, we needs DETAILS! Very difficult to take good pics during the winter months in WI. I do morning and night feeding in the dark during the week and the sun has been hiding lately on the weekends. Her first taste of snow. 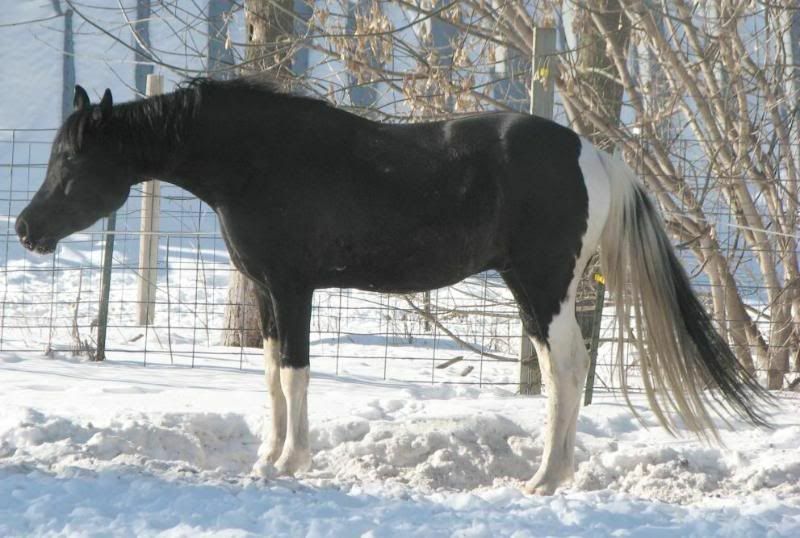 Sire is Gunner a 2005 99.2 % Arabian black tobiano and dam has 3 crosses to Hal Gazal. [attachment=60858:Codi (Clinic).jpg] Congrats on such a sweet thing........my fav color too! Just adorable. She is gorgeous, I love her face, her body is beautiful as well, then add color, the whole package!! "Love what you have, make what you love, and you will be successful." She is a cutie I don't think any of us mind the winter woolies! Especially not those of us with winter in Wyoming. I would be interested in knowing more about your boy, he has a really nice face. His lines are different than my Pintabians and I have been looking for a good stallion to cross some of mine with, hoping for homozygous. Might be interesting. Wish I could buy your filly but I need to breed too many mares this year, plus I wouldn't be surprised if you weren't going to part with her anyway. She is a special one. Breeders of performance straight Egyptian Arabians. Our second foal 3/5/10. A breeding stock Pintabian /Half-Arabian bay colt . Going to be a big boy dam is a straight Russian.